Planning some free activities and yet an educational one for your little ones during this School Holiday ? 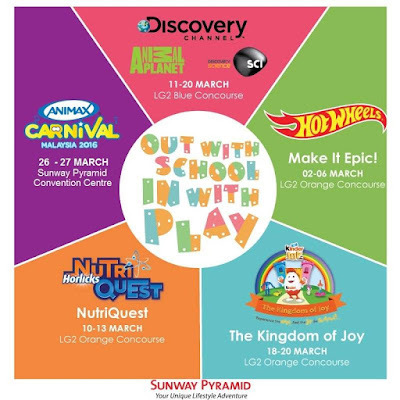 If the answer is YES, then head over to Sunway Pyramid coz' they are celebrating the March School Holidays through an adventure filled time with Discovery Channel's Discovery Explorers from 11th March till 20th March 2016. Held at the LG2 Blue Concourse of Sunway Pyramid, me and my Little Angels had fun-filled time with three different games and challenges. The games are fun and educational too. Now, let me bring you to the tour of the activities there. At Discovery Channel section, my Little Angles learned about handling crane where they stoop and bend when loosening and picking up the stones with the scoop device. You can also wear the uniforms as a miners and take photos with your little ones so that your little ones will know how it is like to be like the miners. At Discovery Science, your little ones will learn something on science here. The worker below explained to the children and parents on how actually winds blow. Children understand it more coz' they see it from their own eyes. The lady below showed the girls on the method to connect the wires to get the electricity. My Little Angel wearing like a scientist to take a photo for remembrance after completed her science activities. At Animal Planet, you can see beautiful under the sea animals and livings here. Try on their Virtual Reality where you can discover a 360 virtual reality experience. Eventhough just a minute of viewing, they truly enjoyed it so much. You can also take photos with the diving costumes complete with the snorkeling and scuba diving sets. Mask, diving fins and safety jacket to wear with. After completed the 3 stations on Science, Channel and Animal Planet, remember to redeem a gift at the redemption counter. If you like their facebook page of Astro Circle at Astro booth located there, you can spin the wheel and bring home a gift too. For more informations and updates, do also follow Sunway Pyramid's FACEBOOK and WEBSITE. Out with School In with Play, lets come to Sunway Pyramid now to let your little ones to explore each and every activities so that they can enjoy themselves while learning something new. Expect some freebies, exciting activities and maximum fun awaits all of you at Sunway Pyramid for the whole month of March. My Little Angels now looking forward to "The Kingdom of Joy" which will happen from 18th March till 20th March 2016 at LG2 Orange Concourse since they are the fans of Kinder Joy. Syafiera, they had fun playing the crane. Let them feel what normally miners did. Such a good idea during school hols, think my kids would love this too! Farena, it is still going on. Bring your kids there to enjoy while learning something there. Its free and your kids might bring home some mystery gifts. wah the activities look so fun. must bring my kids there. Rane, you should. Your kids will have lots of fun. sunway pyramid has many activities for the kids. great place to eat and shop and spend family time. Sherry, agreed with you. Family shopping mall. Something great for them to spend with. Learn while play. Miera, no worries coz' the activity till 20th March. You still got times to bring your daughter there to play. such a good experience for the kids. good way to spend their school holiday! Geng Qian, something different for them to explore. Shini, its true especially they can learn something on science and how miners did their job. Xin, never too old to learn anything. We must keep on learning. You're a great mama, you always brought your child to attend the educational event and let your child explore themselves. Thanks Yoke Ching for your compliments. This is the only way I can let them to explore something new. Bet the kids will be having great fun at Sunway Pyramid these time. All these activities looks very fun!! Wish I was a kid again, lol! Wow this is so cool, I am sure the kids had a great time there. Kelly, they indeed had and learn something too. Fun fun fun for kids! As an adult, I would love it too. Sharon, you're too big. Fun for children and family to play together. Argh, I just got to know this today. Hopefully I will be free during the weekend so that I can bring my nephews there. Sounds like a great day the kids have had. Thanks for sharing. For all these fun activities, I would love to be a kid and enjoy it along. so much to do in our short school holidays. the kids seem to learn a lot at this scientific event. Great place to spend our short school holiday.. Nice nice nice! mummy jane is everywhere! :D.. i always frequent sunway pyramid, alone, for business or with family. This is good news indeed.